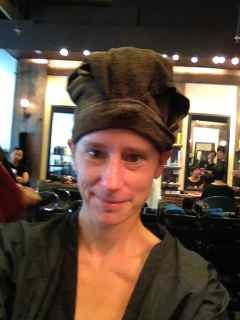 Last summer I had a Filipino transgender cut my hair for $2. Wasn’t the best haircut I’ve ever had, but it certainly wasn’t the worst, by a long shot. 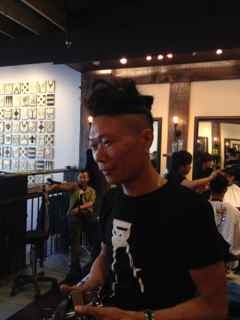 And, just hanging out for the afternoon with her/him and the gang at the corner salon was an experience. We drank orange Fanta and talked about boys. 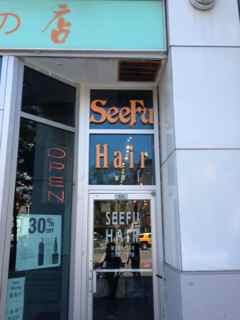 Heading north, I walked into the first place I found: Seefu Hair. I was the only caucasian. Mostly southeast Asians, my hairdresser,Tony, didn’t speak much English, but somehow my hand gestures transpired into the best haircut I have ever had. Without washing, or even wetting my hair first, Tony starts cutting and snipping into the air — it reminds me of Edward Scissorhands. Hair is flying in all directions. And more than the haircut, a little Japanese girl washed my hair twice in a fully reclining chair. “That smells like watermelon,” I say to her. Giggle. A few minutes later, I try again to initiate conversation: “you have great hands.” Giggle. With this elaborate get up on my head, I feel like some exotic species from Star Trek– Zendorees. That is my new species. Waiting for Tony to finish cutting another person’s hair, giggle-girl massages my shoulders. I think some drool escapes out of the corner of my mouth. Paying the bill, I expect a huge bill. It’s got to be at least $100, but I was willing to pay it for all of this. $45. Yup, this place is a keeper. Walking out, I grab my bike (they let me bring it inside the shop), and search for some grub. You could spend a thousand years eating in Toronto and never hit up the same place twice. 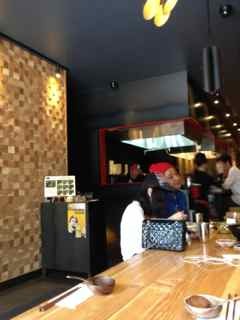 Kinton Ramen is a block down the street from me; I’ve passed it a gazillion times and never gone in. Today, it’s time. I’m sitting at a long picnic table with young Vietnamese teens staring at their phones. 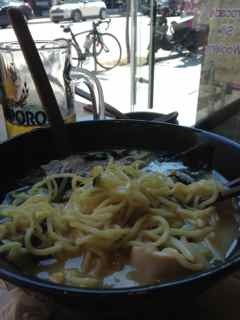 The waitress brings me a menu: make your own ramen. Ramen noodles became popular after the second world war when flour from the states was making its way to Asia; then, the Japanese soldiers returned from China and continental East Asia. 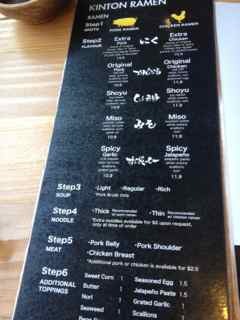 Ramen has many permutations but it starts with either a pork of chicken broth, then you add on from there. I opt for seaweed, corn, boiled egg and roasted chicken in a pork broth. Cray Cray. 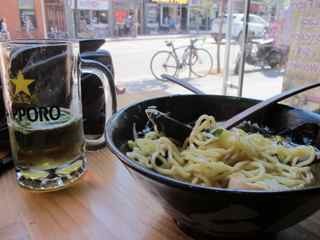 Oh, I wash it down with a mojito beer and dumplings. I hardly put a dent in the head-sized bowl. Four dumplings, a pint of brew, and ramen for under $30. I may never purchase groceries again. Heading to the washroom, I’m mystified: mouthwash, q-tips, pads. Many fancy restaurants don’t have bathrooms like these. I love being surprised. Wondering home, full and stylish, it doesn’t take much effort to be amazed in this city. Just walk out the door, or around the corner. I’d love for Tony and giggle girl to do my head. Ahhhh. And that ramen sounds oh-do-yummy. Have you ever made this at home? Doesn’t sound too tricky, or is it? We don’t have these kind of restos in my ‘hood … so may try and find some recipes on line.